I usually don’t post many things that aren’t made with sugar. There are a few exceptions every now and then though because some things are so delicious that I have to share them with you, regardless of whether they’re cake or not. The funny thing is that this soup is in fact made with a lot of butter. It has flour too. Mushrooms. White wine. Leeks. It’s perfect on a cold winter day or really any Canadian day. I added baby onion sprouts on top to add a little bit of a crunch, but they’re entirely optional. The soup is great with or without them. Before I had this soup I was completely against all cream based soups. Every single time I had a cream based soup it tasted strange and so I eventually learned to avoid them. Then I had this soup and everything changed. This creamy soup was better than any other soup I’ve ever had. I had a life changing experience a few days ago: I began to love cream-based soups. Perhaps it was not the cream I fell in love with though. How could you go wrong with mushrooms, thyme, and leeks? 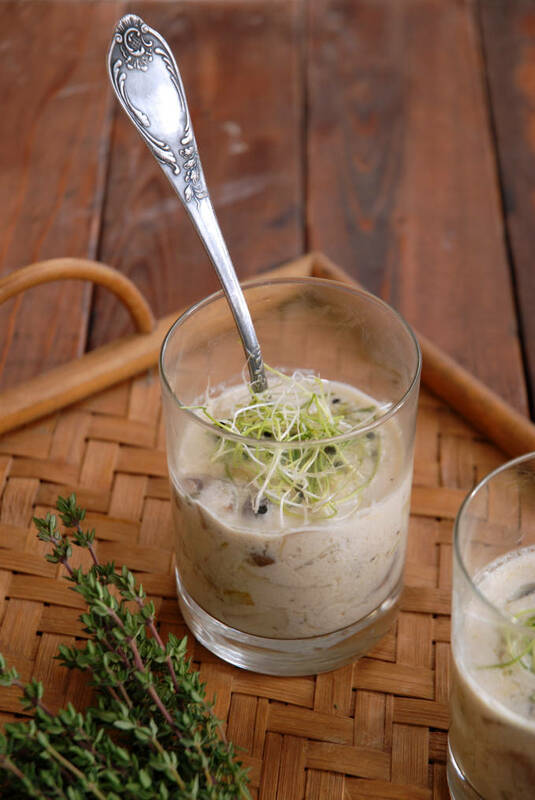 It’s perfectly creamy but the mushrooms and onion sprouts provide some texture. This soup is on a new level of yummy. Try it out and let me know how you like it. You won’t regret it. 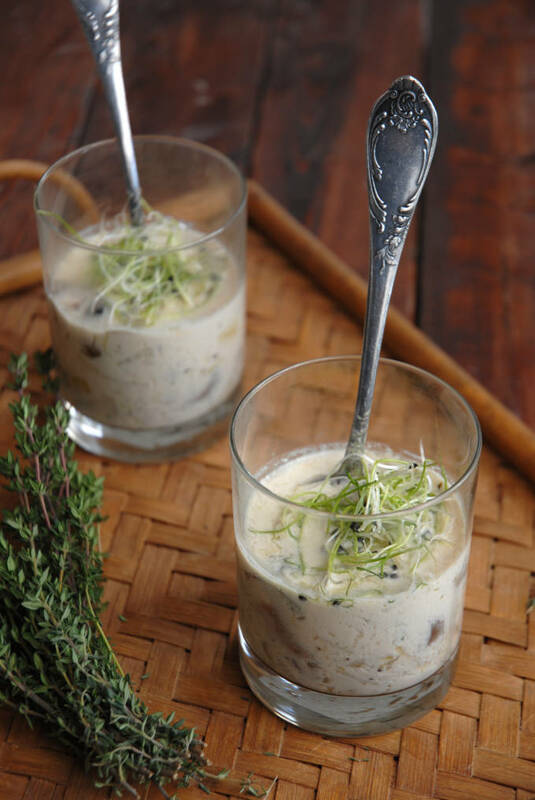 This cream of mushroom soup recipe is fabulously creamy with some texture. Recipe slightly adapted from Ina Garten. Clean the mushrooms by wiping them with a dry paper towel. Don't wash them! Separate the stems, trim off any bad parts, and coarsely chop the stems. Slice the mushroom caps ¼-inch thick and, if there are big, cut them into bite-sized pieces. Set aside. To make the stock, heat the olive oil and 1 tablespoon of the butter in a large pot. 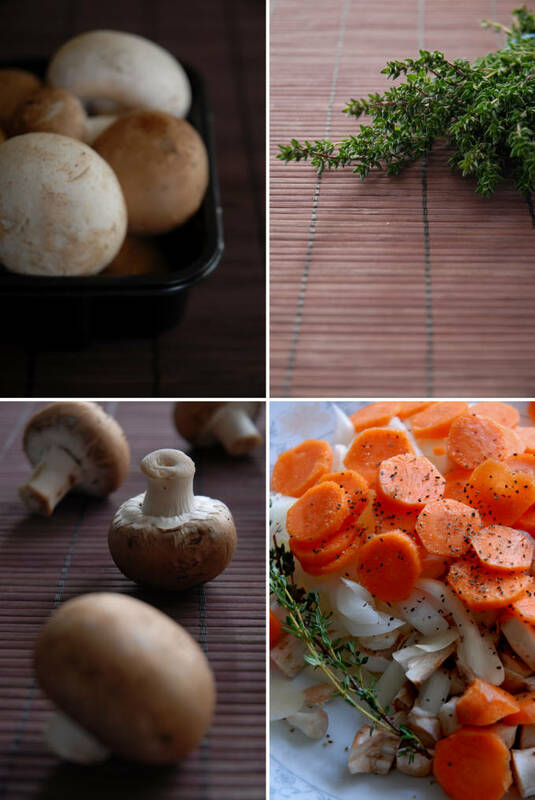 Add the chopped mushroom stems, the onion, carrot, the sprig of thyme, 1 teaspoon salt, and ½ teaspoon pepper and cook over medium-low heat for 10 to 15 minutes, until the vegetables are soft. Add 6 cups water, the chicken bouillon powder, bring to a boil, reduce the heat, and simmer uncovered for 30 minutes. Strain, reserving the liquid. You should have about 4½ cups of stock. If not, add some water. Meanwhile, in another large pot, heat the remaining ¼ pound of butter and add the leeks. Cook over low heat for 15 to 20 minutes, until the leeks begin to brown. Add the sliced mushroom caps and cook for 10 minutes, or until they are browned and tender. Add the flour and cook for 1 minute. Add the white wine and stir for another minute, scraping the bottom of the pot. Add the mushroom stock, minced thyme leaves, 1½ teaspoons salt, and 1 teaspoon pepper and bring to a boil. Reduce the heat and simmer for 15 minutes. Add the half-and-half and cream and then season with salt and pepper, to taste, and heat through but do not boil. Serve hot garnished with baby onion sprouts. I love Cream of Mushroom soup. It reminds me of when I was little and my mom would make it for me before I went to school in the afternoon. 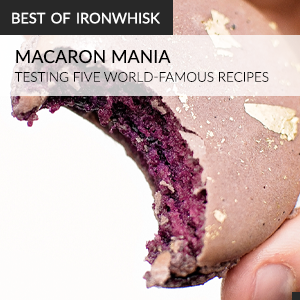 Will be adding this to my recipe box! I agree – can’t go wrong with mushroom, thyme and leeks. I’d have to say those are some of my favorite flavors!! I really enjoy the earthy flavors of mushrooms and leeks. Perfect soup! I love the glass cups used as bowls and the green onions on top are inspired. Looks and sounds delicious. Mushrooms and butter are a match made in heaven, and you really don’t need much to bring this combo alive, a small pat will often do. Ina’s recipes are usually too rich and unhealthy for me, but I can appreciate them. Mushroom soup is really one of my favourites and is perfect, as you said, for such a dreary fall day. You just listed all the makings of a great soup and this is something I could really dive into! That has got to be the most gorgeous mushroom soup I have ever seen. I’m absolutely going to make this next week! This soup looks wonderful. I never liked cream of mushroom soup (read: canned) until I had homemade. What a difference! It looks perfect for a cold evening or weekend lunch. This soup sounds perfect and delicious. My whole family is crazy about mushrooms. I bet they would love this soup.